First, I'm using the ASG logo as the main crest, in lieu of the usual NHL shield, and here's why. This year, we are fortunate to actually have a pretty solid logo for the ASG, but in years past I know we as a community have been left wanting more. It occurred to me that perhaps, if the branding teams for the ASG knew their logo would be front and center of the fan gear jerseys, they would be held to a higher standard and deeper scrutiny to produce consistently good logos for the event. Second, we've all heard the rumors flying around that the NHL wants to get into having corporate sponsors on the jerseys. As a Red Wings fan, I couldn't be more upset by this prospect. However, if the NHL wanted to try it out in a manner that doesn't threaten tradition where they can gauge fan reaction, why not throw your ASG sponsor's logo on the shoulder? Hence the Honda logo on the opposite shoulder from the player's team logo. 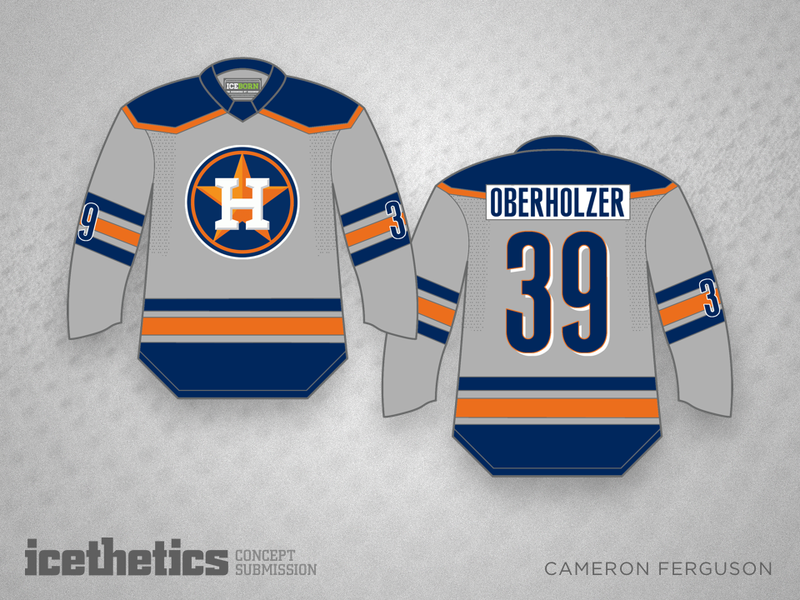 Lastly, the color/design choices. I wanted to keep each look to a two-color design, to reflect the sweaters of the host Tampa Bay Lightning, and I wanted colors from the ASG logo. The Atlantic Division, in which the Lightning play, get the home team colors of blue and white. I really like the scrolling "pirate" motif from the bottom part of the logo, so I used that along the waist of the jersey. A few years ago, I wrote an article about some truly surprising logo and jersey designs considered by NHL teams in 1990s. One of those was a logo Ken Loh created for the Carolina Hurricane — that's singular, as in one hurricane. Cameron Ferguson was inspired by that logo and put together a pair of uniforms to imagine what the relocated Hartford Whalers could've looked like during that first year in North Carolina. It's awesome but it's freaking me out. It's the one weekend a year where the hockey and baseball regular seasons overlap so they're overlapping on the Concepts page as well. 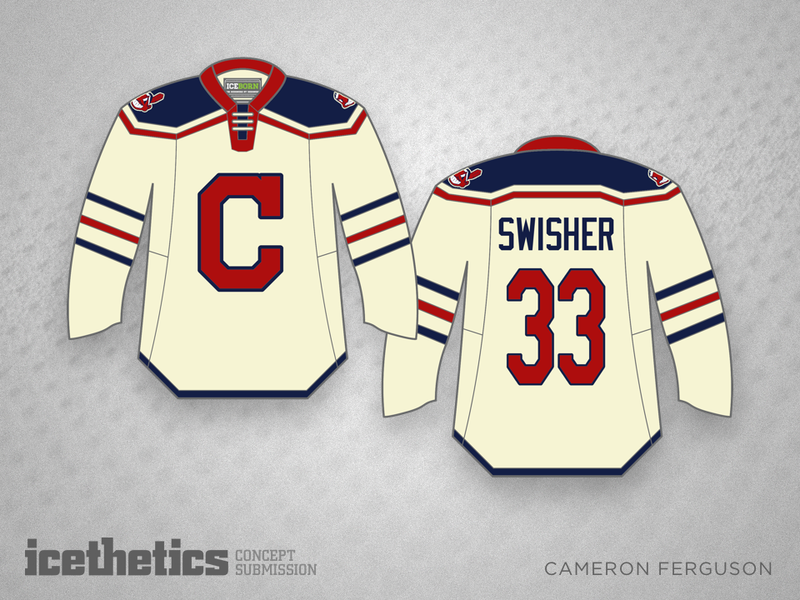 Cameron Ferguson presented the first half of his set of MLB hockey sweaters yesterday. Here are the rest. As baseball season gets underway, I thought we could spend the weekend with something a little offbeat. 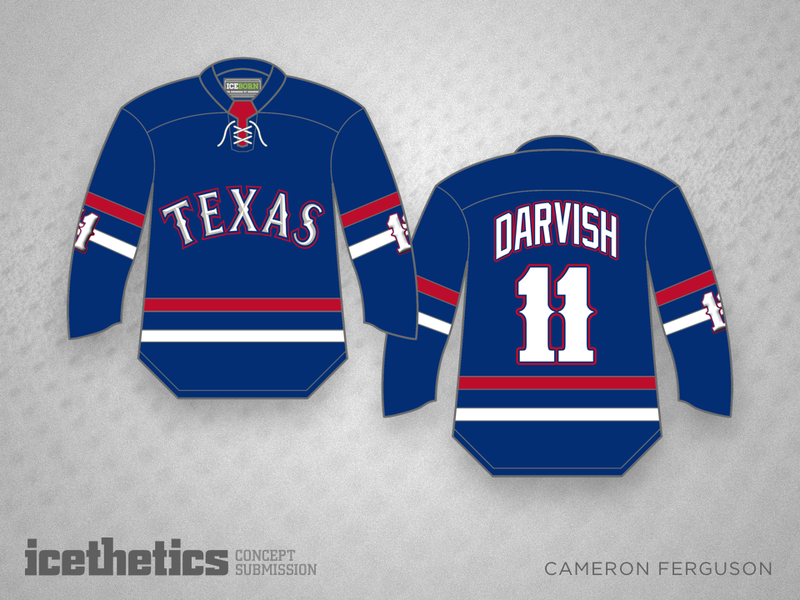 Cameron Ferguson has designed hockey sweaters for all 30 MLB teams. Today we have the American League. Check back tomorrow for the National League.